In this episode Shahriar goes through the teardown and repair process of a Fluke 196B Handheld ScopeMeter. This unit, which has been purchased as a “dead” unit from eBay, is examined for faults. During the teardown, various PCB components, architecture and design is presented. The performance and functionality of the unit is verified with a few brief experiments. Finally, the schematic and block diagram of the Fluke 196B is explored for the finer details of its design and operation. my fluke scopmeter 196c was working fine but suddenly it seems like it got stuck on the reset screen. I have the exact same problem with an old (2004 manufacture) unit that sat on a shelf and was never used until this week when I removed the battery and managed to get it going again by direct connecting it to a power supply to get it charging. I mean this unit still has the plastic on the screen and the probes were sealed in original bags. Once I thought things were going okay, I realized I could not move off of the screen it starts on. I can connect a probe to to channel A and it seems to work but I cannot do anything else or change any settings. All keys non-responsive except “power” and “user” button when pressed and turn on to reset. Otherwise “user” button is dead also. This lead me to rule out the keypad foil being an issue plus this has never been used. Has anyone run across this situation. Very nice video, clear explanation. Grats of the scope, that was a good bargain. You mentioned you were able to get the service manual online. Can you direct me where you found that? I have a fluke 93 scopemeter that for some reason suddenly the “S TIME NS” buttons do nothing. I have checked the ribbon cable, traces, pads under the button. All look ok. A schematic would be a great help to see if the signal is getting to the ic. I have contacted fluke, but they say “if its not online, its a trade secret”. lol. I would appreciate any advice you can direct me to. Great video, just to add the PSU is analogue and I believe any ‘close’ voltage will do. My PSU was faulty and a purchased a new one from fluke which @ over £100 and it was extremely noisy, I then purchased a switching supply which worked great, but you can’t use at the same time as doing sensitive low level measurements due to the injected PSU noise. So beware. Indeed, what a great video. Best thumbs up to you on that one! I happen to own this model and hoping for a bit of advice from you as to what could be the problem. When I turn the unit “on” the screen only flashes off/on with nothing displayed and beeps with each flash. When I do plug in the supplied transformer with the unit “OFF” I hear the regulator/relay in the unit clicking back and forth. If I turn the unit “ON” in this mode, the relay does stop clicking and back to the flashing blank screen with beeps with each flash of the screen. I verified the battery is charging when transformer is plugged in. Having the same problem…can you email me…have you found out the problem? I have the same problem with Fluke 196B. Could you please tell me, have you solved this problem? Thank you in advance, Ivan. polosatos@yandex.ru. Sorry to dig this out since it’s been long time..
Have you fixed the problem? And how.. I got exactly same this trouble.. I had the same issue on old Fluke 199 (without b/c). The problem was in faulty battery. You can just disconnect battery and the unit will work with power adapter. If so you need to order new battery. I was hopeful you can help me. 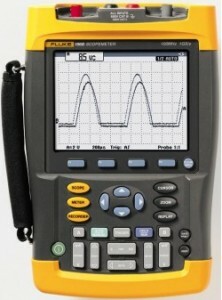 I have a 199C 200Mhz Fluke Oscilloscope. It was working fine but suddenly it seems like it got stuck on the reset screen. I turn it on and the screen works just fine, but when I hit any button nothing happens. So I can’t display menus at all. F keys don’t work either. On the screen input A seems to be enabled but, I can’t change any input options since the buttons don’t seem to work. Have you encounter this issue before? I have the same problem with the same scopemeter if you could respond us I would really appreciate it. same problem with the same scopemeter, if you reach a solution please contact me, thanks. First of all I’d like to say that I really like your video’s! I just wanted to share a little trick with you. In the repair you cut away the diode. What I usually do is use a standard soldering iron and use a large drop of soldering tin on the tip. and use the blob of solder to heat up all the pins of the small package. and when desoldered it usually holds in the tin on the tip of the soldering iron. It mostly works just fine :). I’ve removed quite some smd components from some tight places this way. As it happens I have a Fluke 199B Scopemeter on loan (see http://sigrok.org/wiki/Fluke_ScopeMeter_199B). I’m noticing the same display flickering as you saw, so I guess that’s normal. Great, thanks for letting me know. I am getting used to it. I do wish it has an LED back-light.